October 8, 1999: I'll huff and I'll puff and I'll blow my house down. This is no idle threat in the case of the nebula called Eta Carina. Just three years ago the Hubble Space Telescope provided a dazzling image of a star that was blowing off massive quantities of material in a blast that looked like a supernova yet, mysteriously, wasn't one. Now the Chandra X-ray Observatory has looked at Eta Carina and showed details that are, well, shocking.
. Credit: Chandra Science Center and NASA. "It is not what I expected," said Dr. Fred Seward of the Harvard-Smithsonian Center for Astrophysics. "I expected to see a strong point source with a little diffuse emission cloud around it. Instead, we see just the opposite- a bright cloud of diffuse emission, and much less radiation from the center." The Chandra image reveals a hot inner core around this mysterious superstar. 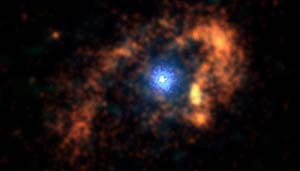 The new X-ray observation shows three distinct structures: an outer, horseshoe-shaped ring about 2 light years in diameter, a hot inner core about 3 light-months in diameter, and a hot central source less than 1 light-month in diameter which may contain the superstar that drives the whole show. The outer ring provides evidence of another large explosion that occurred over 1,000 years ago. All three structures are thought to represent shock waves produced by matter rushing away from the superstar at supersonic speeds. The temperature of the shock-heated gas ranges from 60 million deg Kelvin in the central regions to 3 million K on the outer structure. Eta Carinae is one of the most interesting and perplexing objects in the entire Milky Way. It was discovered, as a variable star, in 1677 by Sir Edmund Halley, then made its mark on modern astronomy during the "Great Eruption" of 1837-56. The star brightened to magnitude -1, second only to Sirius in brightness. It is also known as NGC 3372 and as the Homunculus Nebulae which sits inside the larger Keyhole Nebula. December 2: What next, Leonids? Since it looked like a supernova, one naturally would assume that was the end of the star. All that should be left are beautiful nebula and, perhaps, a neutron star or black hole where the original star once stood. 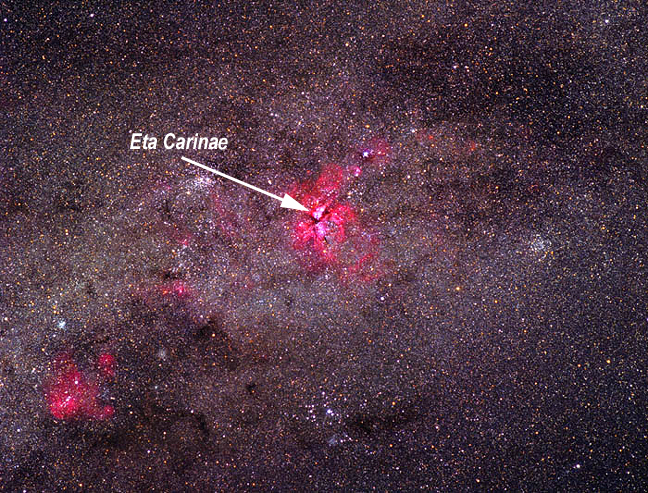 Instead, Eta Carinae is still there (in a subtle bit of innovative grammar, astronomers refer to the star as Eta Carinae and the nebula as Eta Carina).
. Credit: Elisha Polomski, U. Florida/CTIO. It dimmed until only telescopes could detect it - until 1940 when it started brightening again and became visible to the naked eye. Located about 10,000 light-years from Earth (some estimates are as low as 7,500 light-years), the star is more than 150 times as massive as our Sun, and emits energy at a rate 4 million times greater than the Sun (most of Eta Carinae's radiation is at infrared wavelengths from dust in the bipolar nebula). In 1996, Hubble was trained on the star and revealed a massive cloud resembling two balloons extending from either side of a pie plate. These are two spectacular bubbles of gas - each as wide as our entire solar system - expanding in opposite directions away from a central bright disk at speeds in excess of 600,000 km/h. The odd shape is believed to be partly due to the star's intense magnetic field channeling plasma.
. Credit: Chandra Science Center (right) and John Gleason & Steve Mandel (below). "The Chandra image contains some puzzles for existing ideas of how a star can produce such hot and intense X-rays," agreed Prof. Kris Davidson of the University of Minnesota. Davidson is principal investigator for the Eta Carina observations by Hubble. 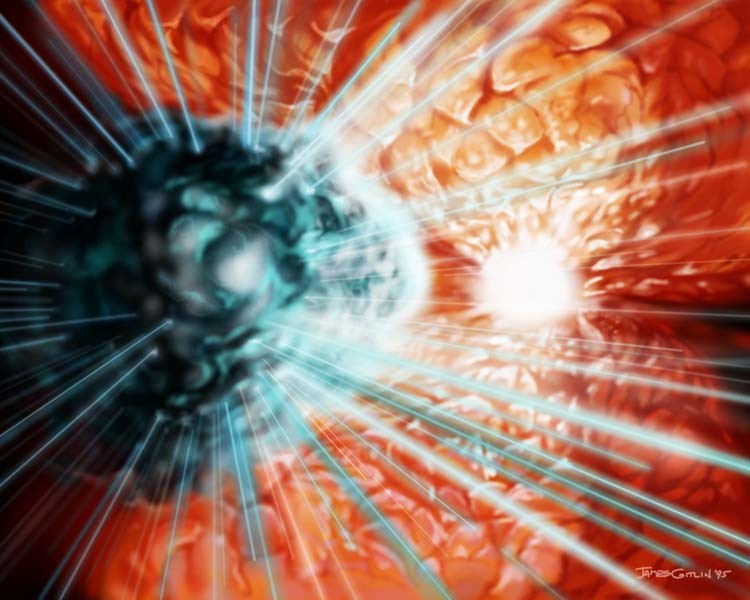 "In the most popular theory, X-rays are made by colliding gas streams from two stars so close together that they'd look like a point source to us. But what happens to gas streams that escape to farther distances? 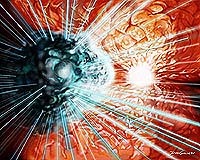 The extended hot stuff in the middle of the new image gives demanding new conditions for any theory to meet." And a Death Star as well? As if its huffing and puffing behavior weren't weird enough, Eta Carina also appears to be a Death Star powerful enough to make Darth Vader turn in his light saber. 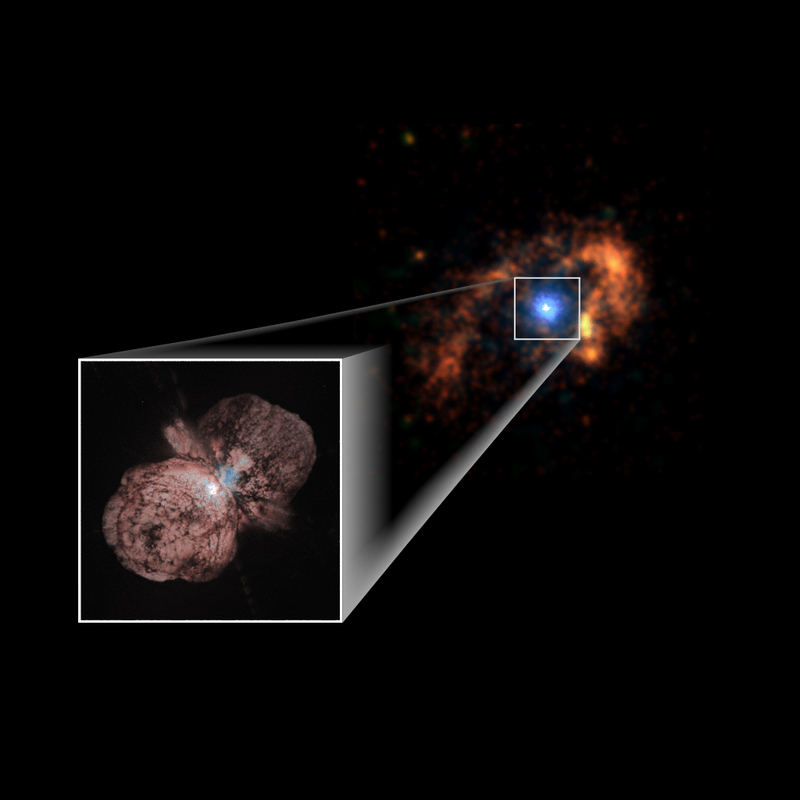 Sveneric Johansson, a specialist in atomic spectroscopy at the University of Lund in Sweden, has proposed that Eta Carinae also is acting as a massive ultraviolet laser. Johansson, using Hubble observations made with the Goddard High-Resolution Spectrograph, reported in 1996 that his interpretation is not yet proven, but that it appears to be the most plausible explanation of the data. A laser (Light Amplification by Stimulated Emission of Radiation) creates an intense coherent beam of light when atoms or molecules in a gas, liquid or solid medium, force an incoming mix of wavelengths (or colors) of light to work in phase, or, at the same wavelength. Laser light is analogous to a loud, single-pitch note, while normal white light is analogous to audio static on a radio.
. Credit: James Gitlin, Space Telescope Science Institute. Johansson's explanation is not that far-fetched. 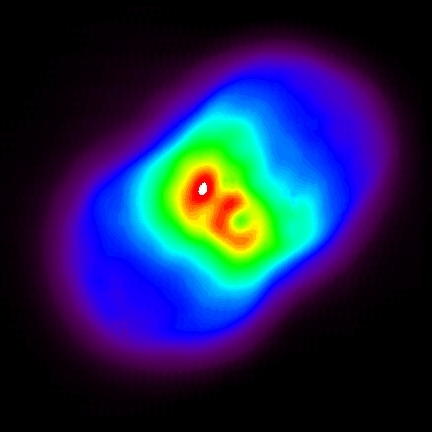 Natural masers (the microwave version of a laser) have been seen in space since the mid-1960s, and an infrared laser was discovered around the hot young star MWC 349, earlier this year. "Each ultraviolet light particle (photon) generated in the Eta Carinae laser has almost 700 times the energy of a photon in MWC 349, and so the total energy output is far greater," said Davidson. "Natural infrared lasers are very rare in space; this ultraviolet laser is even more difficult for nature to arrange, and nothing like it has been seen before." In a Hubble Space Telescope investigation led by Davidson, including nine other collaborators in the U.S. and Sweden, ultraviolet light from the same gas is being closely studied. Johansson was particularly interested in emission by iron ions that seemed unnaturally bright in the new data. He has found the only plausible explanation of the relative brightness of the iron emission lines is a natural laser emitting at energetic ultraviolet light. "The spectrum of singly-ionized iron (an iron atom with one electron removed) has almost a thousand known energy states and some of these are apparently well-suited to making a laser effect," said Davidson. 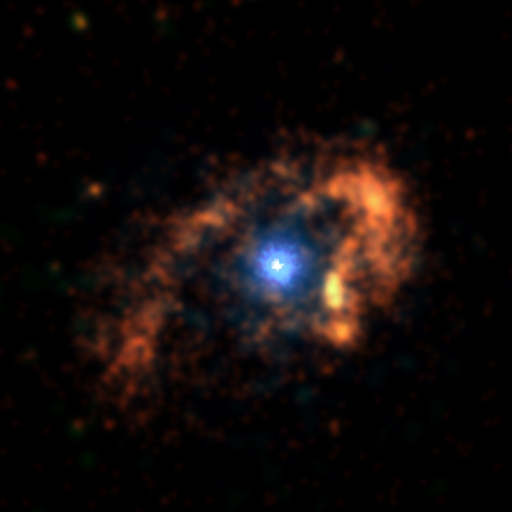 High resolution digital versions of the x-ray image and associated information on Chandra are available at: http://chandra.nasa.gov http://chandra.harvard.edu/photo/0099/index.html or http://chandra.harvard.edu. Hubble images are at http://oposite.stsci.edu/pubinfo/pr/96/23.html. If it's not a supernova, then what is Eta Carinae? Astronomers still do not know what lies at the heart of Eta Carinae, but most believe that it is powered by an extremely massive star that may be a 150 times as massive as the Sun. Such stars produce intense amounts of radiation that cause violent instabilities before they explode as a supernova. The outer rings seen by Chandra are evidence of an ancient eruption that preceded the 19th century "Great Eruption." So, we can expect Eta Carinae will huff and puff a few times before it finally blows its own candle out in a true supernova. 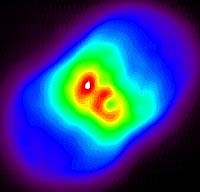 Further Chandra observations of Eta Carina are planned for the near future and should give astronomers deeper insight into this cryptic colossus. NASA's Marshall Space Flight Center in Huntsville, AL, manages the Chandra program. TRW, Inc., Redondo Beach, CA, is the prime contractor for the spacecraft. The Smithsonian's Chandra X-ray Center controls science and flight operations from Cambridge, MA.